A couple of years ago I started taking an interest in talking to the dead. I bought a digital recorder and went to the cemetery to check it out. 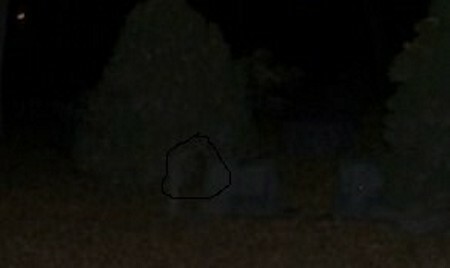 I was so excited to capture a voice on my recorder and to capture a picture of the spirit I believed to be communicating with me. The tombstone said his name was Martin. I went back several times and got responses each time. On December 20th I went to the cemetery to place a small seasonal decoration on Martin's stone. Later that night I was sitting at home watching late night TV. Suddenly something slammed into the side of my house. It was a very loud sound and startled me. I looked up to see my cat's toy begin swinging back and forth like someone had struck it with force. I felt like someone had opened the door and cold air had filled the room. The cat toy continued to swing back and forth. My heart was pounding in my chest. I glanced at my television set and moving on the screen was a huge blue fly. I felt fear creep up my spine as goose bumps covered my arms. I stood up and asked ''Is someone there?'' Thinking I needed to use my recorder I started to leave the room to retrieve it. Glancing back at the TV I saw that the fly was gone. Turning my head I realized the fly was right in front of me! I gave a yelp and ran in to the bathroom. The fly followed me into that room landing on the mirror and not moving. Remember this was late December in Idaho. It was freezing cold outside and no reason for a ''corpse fly'' to be flying around in the middle of the night. I turned and ran into my room leaving the fly in the bathroom. Shakily I retrieved my recorder and headed back to the living room, but before I took two steps I realized the fly was in my room. It was flying around right in front of my face. I stepped back in to my room away from the fly, but when I turned it was in front of my face again. Drawing a shaky breath I said ''Please stop following me. You are scaring me. '' I sat down on my bed and closed my eyes and tried to calm myself. When I opened my eyes I looked around for the fly, but it was nowhere to be seen. You are very foolish! That is not the ghost of Martin! A demonic entity followed you home! Why are you people so gullible? Does anyone ever read their Bible? ! The spirits of dead people do not return. They are demonic entities taking the form of people who have passed on!.